Commando operations on or from the Dalmatian islands. Read more here in our No 2 Commando History section. Formed 14th February 1942 as The RM Commando, it was briefly known as "A" RM Commando before being designated No. 40 Royal Marine Commando, Royal Marines. It was the only Royal Marine Commando formed entirely from volunteers as with the Army Commandos. Early training was on the Isle of Wight with the RM Commandos billeted in homes at Shanklin, Sandown and Ventnor. Their notable actions during WW2 are Dieppe [View the Dieppe ROH], St Benere, Termoli, Anzio, Dalmatian Islands, and Lake Comacchio. HMS Fidelity was sunk by torpedoes during a U Boat attack (U435) on the 30th December 1942 off the Azores. The U-boat reported a large number of survivors on rafts and in the water. All drowned in the rough seas as the weather deteriorated. The only survivors were a few who had launched a motor boat from the ship before the attack. Among the casualties were 53 members of 'T' Company 40 RM Commando who were on board. The letter 'T' was never used again by 40RM Commando for a Company. On 17th July 1943 HMS Queen Emma was in Augusta Harbour Sicily with 40 Royal Marine Commando on board when there was a bombing raid on the harbour. This caused numerous casualties and damage on board when concussion and shrapnel from a bomb caused a box of grenades to go off on the mess deck. The role of 40RM Commando during the Combined Operations raid at Dieppe raid was to assault and secure the harbour area. Below is a nominal roll of those who served in 40RM Commando. It is listed by order of surname. Acting Sergeant Basil Aylett was awarded the MM  for gallant and distinguished services in operations with 40RM Commando leading to the capture of Termoli. 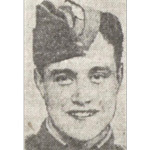 Marine Royce Baldock died during operations in Sicily whilst aboard the HMS Queen Emma during an enemy air attack on the vessel. Awaits confirmation of Commando service. 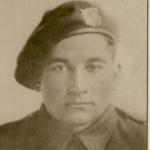 Major David Barclay was killed during operations at Normandy on D Day . 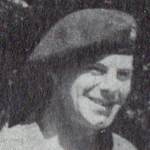 Born in May 1920, Dave Barclay entered the Corps in September 1938. He served in H.M.S. Norfolk for over two years and was appointed to 40th RM Cdo., subsequently transferring to the 41st Cdo. . Extract from the RM Globe and Laurel Nov. 1944 edition. Troop Sergeant Major Harwood Beaven was awarded the MM for bravery and great devotion to duty whilst operating with the Allied Armies in North-West Europe. Cdo. Assoc. Newsletter 65 issued Sept 1977. 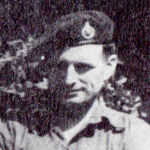 Company Sergeant Major Henry Bennett was awarded the MM for gallant and distinguished services in North West Europe whilst serving with 45RM Commando. The death of "CSM. Henry (affectionately known as 'Wiggie') Bennett, MM. (40 & 45 RM Cdos) of Matlock, Derbyshire", was announced in Commando Association newsletter 82 issued March 1986. Marine George Reginald Bevan was awarded the MM in recognition of gallant and distinguished services in the combined attack on Dieppe. 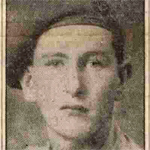 Staff Sergeant Stanley Bostock was awarded the B.E.M. (Military Division) in the 1946 New Years Honours . He had previously been attached to 40RM Commando . He also received a Mention in Despatches in recognition of gallant and distinguished services in Italy . The death of "S/Sgt. Stanley Bostock, BEM. (40 RM Cdo) of Wollaton, Nottingham" was announced in Commando Association newsletter 66 issued March 1978 . Marine Leslie Bradshaw was awarded the MM in recognition of gallant and distinguished services in the combined attack on Dieppe. His death was announced in Commando Association newsletter 108 issued March 1999. London Gazettes Supp 35729, page 4328. Marine Terence Breen was awarded the MM in recognition of gallant and distinguished services in the combined attack on Dieppe. [Source: London Gazettes Supp. 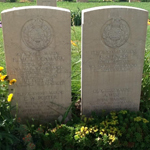 Captain Maurice Brockbank, 'C' troop, died during operations at the River Aller in the vicinity of the village of Hademstorf. He had previously received a MiD whilst with 40RM Commando for "outstanding service while operating with the Allied Armies in Italy." The book A Plain Russet-Coated Captain by Capt. John Day 45RM Cdo. Sergeant John Convery, 'Q' Troop, was awarded the DCM  for gallant and distinguished services in operations leading to the capture of Termoli. 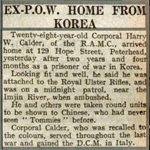 Marine (Temporary Corporal) Charles Cooper received a Mention in Despatches for gallant and distinguished service while operating with the Army in Italy in 1944 . The following year, now a Sergeant, Charles Cooper was awarded the M.M. , for gallant and distinguished service displayed in the Italian campaign when taking part in the operations in April, 1945, north of the Reno and west of Argenta . Captain Francis Ford died during operations in Sicily whilst aboard the HMS Queen Emma during an enemy air attack on the vessel. Corporal James Gorman was awarded the MM for courage, leadership and resource in operations which led to the crossing of the Garigliano River in the face of determined opposition from the enemy. London Gazettes Supp. 36474, page 1777. National Archives file WO 373/47/155.